The Wave arrived on Aug. 14, 2018. Have you had a chance to get your Wave card yet? If you missed the buzz, The Wave is your new ticket to ride The Rapid! Say goodbye to dealing with paper tickets or fussing with cash and change. Your Wave card is a faster, easier and more convenient way to pay your fare. 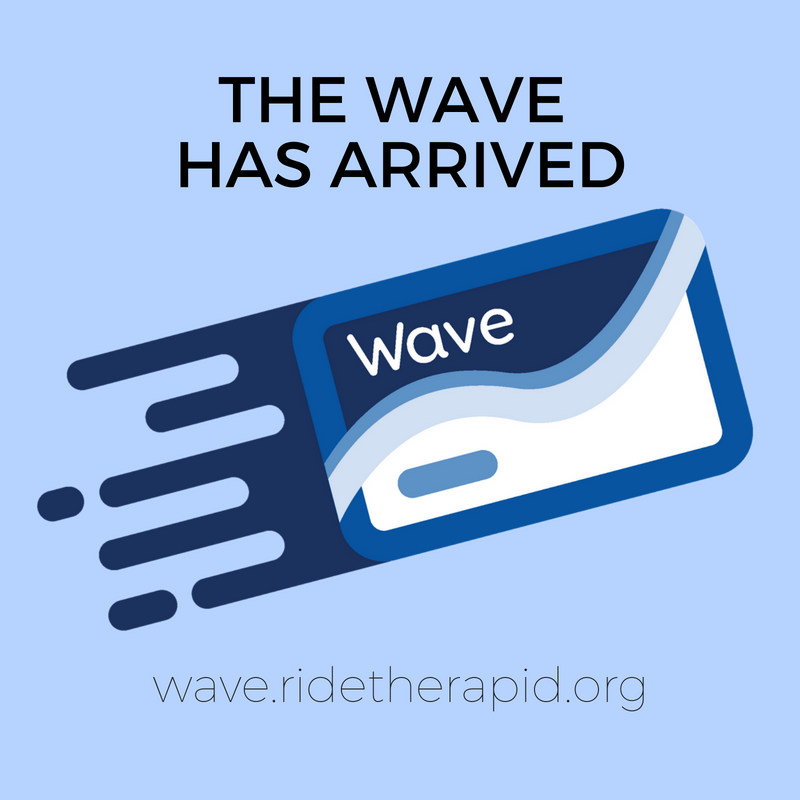 You can purchase your Wave card at Rapid Central Station or at wave.ridetherapid.org. Say goodbye to paper tickets or struggling to find the exact fare. With The Wave, you’ll simply need to touch your card to the reader every time you board or transfer. There will be Wave readers on every bus and at every Silver Line Station. This means faster boarding times and no fussing with the farebox. When you ride The Rapid using your Wave card, you can get the savings of daily, weekly and monthly passes, but without the commitment or the upfront cost. You pay your way one trip at a time, and you’ll never pay for a trip you don’t take. The Wave will give you the best deal on your fare based on how much you ride. It’s a ‘pay-as-you-go’ pass: Earn a day pass after riding twice in one day, or a monthly pass after riding twice a day for 20 days. In other words, once you’ve reached the cost of a monthly pass, you’ll receive unlimited rides for the rest of the 31-day period. So everyone gets the savings of a pass without the upfront cost. Top off your account anywhere, anytime using wave.ridetherapid.org or by visiting the Information Center at Rapid Central Station. You can also use the auto-load feature to add funds when your balance is low! It’s simple. Once you add a payment method to your account, just choose the balance amount you want auto-load to kick in at and then select the amount you want to add to your Wave card. You can quickly register your card and set up a funding source using our mobile-friendly website. Your Wave account allows you to manage multiple cards, see a history of your recent trips and transactions, and deactivate/reactivate a lost or stolen card. And don’t forget to set up auto-load, so you’re never stuck without fare. Get your Wave card today and start tapping your way to savings! 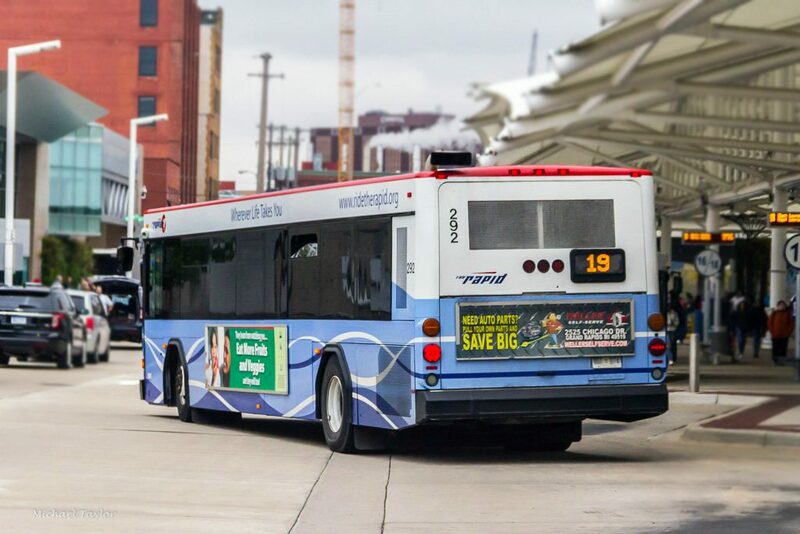 The City of Grand Rapids’ Downtown Area Shuttle – or DASH – will launch expanded service that features later hours, weekend rides and more convenient routes all for free and with a new look starting Monday, Aug. 27. The weekend service is a first for the DASH, which has operated in downtown Grand Rapids for 20 years. Late-night rides also will be available, with service until 1 a.m. on Thursdays, Fridays and Saturdays. Pickups are scheduled to take place every eight minutes during operational hours at multiple stops along two DASH routes: DASH West and DASH North. All routes will continue to be free and do not require a ticket or pass. The changes are aimed at increasing ridership and accessibility, said Josh Naramore, manager of the City’s Mobile GR-Parking Services Department. Routes have been shifted and expanded slightly, and stops have been reconfigured to include more popular downtown destinations. DASH West will provide access to the West Side, Monroe Center and Heartside. Points of interest on this route include David D. Hunting YMCA, Kendall College of Art & Design, Grand Rapids Children’s Museum, Van Andel Arena and Bridge Street Market. DASH North will service Creston, City Center and Medical Mile. Points of interest on this route include DeVos Place, Downtown Market, Founders Brewing, Spectrum Health and Belknap Park. 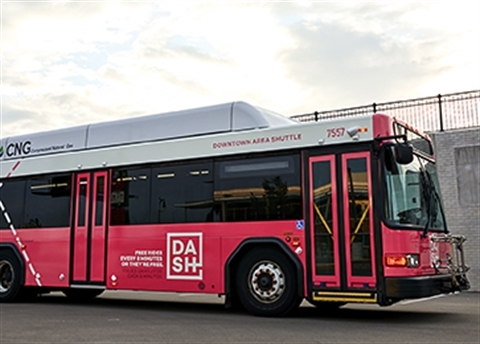 Along with expanded service hours and routes, the DASH also will have a new look. With these improvements, the Mobile GR team hopes to double DASH ridership within the next year, resulting in 60,000 monthly users. Your new ticket to ride The Rapid is arriving on Aug. 14, 2018. The Wave is a smart, easier and faster way to pay your fare to ride The Rapid. Your Wave card holds pay-as-you-go value. This means you pay your way to the savings of a pass one trip at a time, and you’ll never pay for a trip you don’t take! Learn more about the benefits of The Wave. August has arrived! 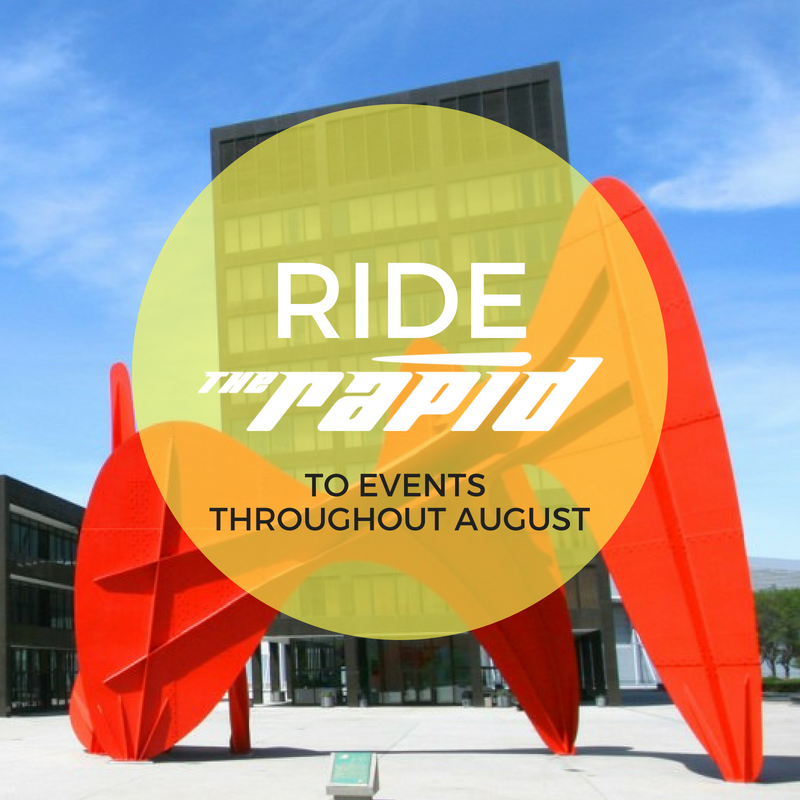 Enjoy the warm weather while it lasts and ride with us to events throughout Grand Rapids and the suburbs. There’s no shortage of good music, tasty food and tons of entertainment. Taste the city from August 8 – 19 for Restaurant Week GR! Savor specially priced lunches, dinners or both at 60+ area restaurants. Special options include 2 courses for $15 per person; 2 courses for $25 per person; Chef’s Choice for over $25 per person. View participating restaurant menus and start planning your restaurant visits. Plan your trip to participating restaurants throughout Grand Rapids. This month, catch Shrek and Hidden Figures on Aug. 3 and Wonder Woman and Black Panther on Aug. 17! This event is free of charge and is the perfect chance to enjoy your favorite movies outside on the big screen. Gates open at 6 p.m. with pre-movie entertainment beginning at 6:30 p.m. The first movie starts at 7:30 p.m. Bring your own snacks or enjoy local fare from the food trucks! Don’t forget your chairs. Ride DASH and Routes 7 or 11 to get to 555 Monroe. Don’t miss this celebration of the rich heritage of the Hispanic community! The Hispanic Festival takes place at Calder Plaza on Aug. 10 -12 and is free to attend. This exciting and immersive event includes a variety of musicians, dancing, food and an outdoor Mercado. Don’t forget to bring cash if you’re planning to shop and eat. Routes 11, 13, 50 and the Silver Line can get you to Calder Plaza. The seventh annual GRandJazzFest takes place on August 18 and 19 at Rosa Parks Circle in the heart of Grand Rapids. Enjoy performances from notable jazz musicians as well as up-and-coming artists for diverse audiences. No admission is required for this family-friendly event. All you’ll need is a blanket or folding chairs and some snacks. Check out who’s performing! Hop on the Route 7 and ride to Blandford Nature Center to listen to music! Blandford is hosting an outdoor music series featuring talented bands that are ready to give your friends and family a fun and relaxing night at the farm. Catch Deep Greens and Blues on Aug. 24 and members of Appleseed Collection on Aug. 31. Ride Route 7 to get to Blandford Nature Center. Don’t miss the popular summer concert series that takes place at Lamar Park. This month, prepare for a rollicking good time with Yellow Brick Road—Dueling Pianos in a free, fun, family-friendly setting. There will be giveaways and a variety of activities to accompany these performances. All concerts start at 7 p.m. Learn more here. On Aug. 11, ride Routes 2 and 44 for a day of celebration at Kentwood City Hall! Starting at 9 a.m. and lasting until 10 p.m., there will be a farmers market, food trucks, live music, a talent show and so much more! View the full Celebrate Kentwood schedule for details. Every week, the City of Grand Rapids Parks and Recreation Department offers a variety of free fitness classes taking place throughout downtown Grand Rapids. This program is a joint effort through Downtown Grand Rapids Inc. and the City of Grand Rapids Parks & Recreation Department. Free, no-registration classes include Zumba, Tai Chi, yoga and more. Classes take place at Rosa Parks Circle, the Blue Bridge, Sixth Street Bridge, Rapid Central Station and more! View all classes, dates and times here. Mobile GR and The Rapid invite the public to join community, business and civic leaders who are attending an open house to learn details about the Aug. 27 launch of plans to significantly improve The Rapid’s Route 19 service that operates along the “Medical Mile” on Michigan Street through a section of the near West Side along Bridge Street up to Stocking Avenue. The route includes stops near such anchor institutions as Spectrum Health, Grand Valley State University, Grand Rapids Community College, Michigan State University’s College of Human Medicine and the soon-to-be-open Bridge Street Market. 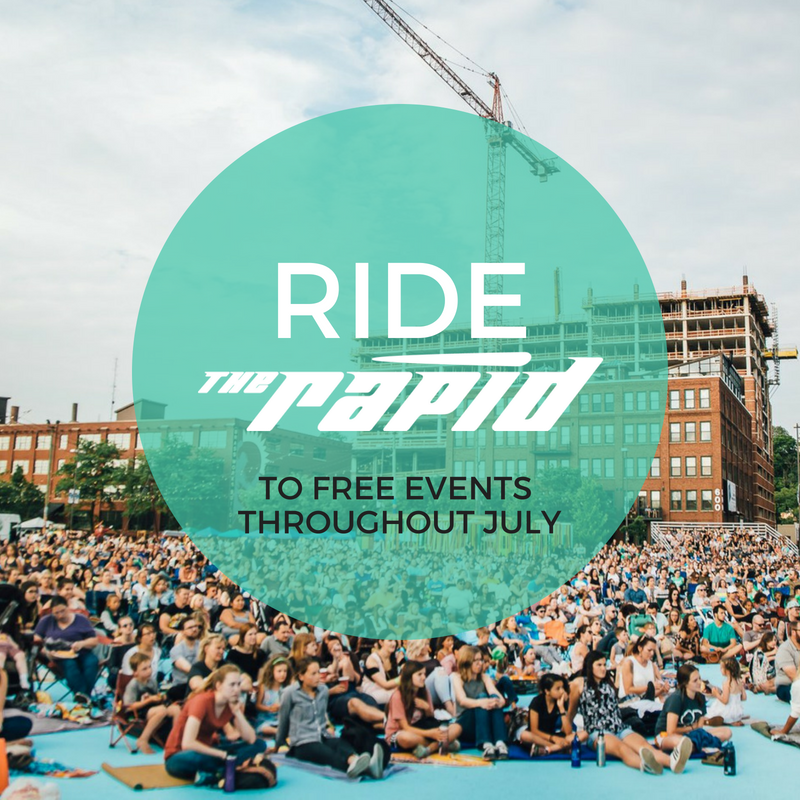 The open house will take place at Rapid Central Station on Monday, July 30, 2018 and will highlight how the introduction of free fares along the route will – in combination with the City’s fare-free DASH service and City-sponsored fare-free portion of the Silver Line north of Wealthy Street – essentially allow free travel throughout downtown Grand Rapids without the hassle of parking. Another feature is the convenience of buses coming every 10 minutes on Michigan Street during peak travel demand. The public transit service upgrades along Route 19 are part of a new three-year pilot program partnership with the City’s Mobile GR and Parking Services Department, the Interurban Transit Partnership (“The Rapid”) and Spectrum Health that will dramatically increase bus service to help reduce traffic and ease parking congestion along the Michigan Street corridor. We encourage you to ride The Rapid to attend this meeting. But you can access free parking in the Amtrak lot at 440 Century. 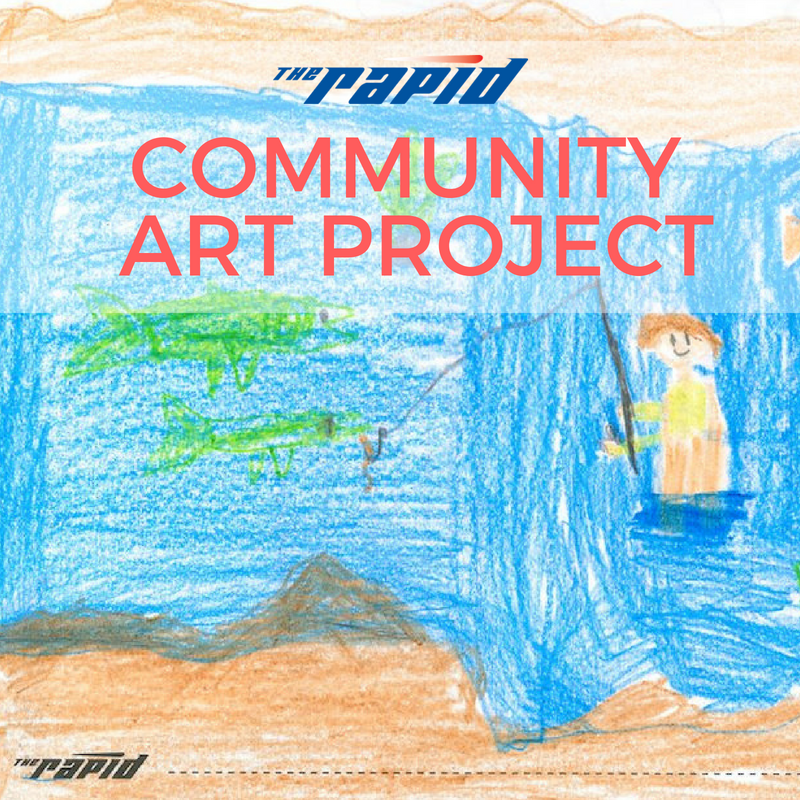 If you’re looking for a fun, easy way to showcase your art skills, The Rapid’s Community Art Project is perfect for you. Deposit it in the specially marked boxes near The Rapid bus at the Maranda Park Party in Kentwood on July 19, 2018. Mail to The Rapid, ATTN: Michael Bulthuis, 300 Ellsworth Ave. SW, Grand Rapids, MI 49503. Entries must be received by Aug. 1, 2018. By submitting your design you are agreeing that your community coloring design may be chosen as a part of a community art project that will be displayed at ArtPrize 10. Like The Rapid on social media to watch the project being developed. Bus Operator of the Month June 2018: Sage S.
It will be four years in November. What I like most about the job is that I meet a lot of different people and get to hear all the amazing things they have done. I do a lot of kayaking and fishing with my family. Congratulations, Sage! Thank you for all you do to keep the community moving. 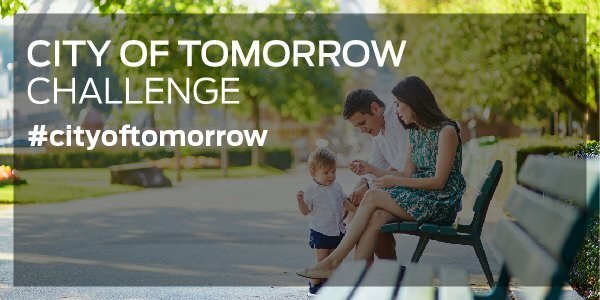 The City of Grand Rapids and Ford Motor Company recently announced the Grand Rapids City of Tomorrow Challenge – a crowdsourcing platform for residents, businesses and community groups to propose and pilot solutions that improve mobility in Grand Rapids. The City of Tomorrow Challenge is focused on identifying opportunities to create immediate impact for residents in terms of improved mobility and support long-term enhancements to help people get around. The City and Ford, in partnership with the Michigan Economic Development Corporation-PlanetM, The Right Place, AT&T, Dell Technologies and Microsoft will facilitate the sharing of information, collaborate with key public and private stakeholders and test ideas. The City of Tomorrow Challenge creates a more inclusive process for residents to express their ideas as they participate in working to ensure a future where people and businesses can thrive. By working with communities to crowdsource new mobility designs and innovations along with funding pilots to test the top solutions, the program’s goal is to help improve quality of life for Grand Rapids residents and visitors by providing dynamic mobility options that build on the existing transportation system. Throughout the eight-month program, those who live, work and play in Grand Rapids are invited to explore dynamic mobility options, including making the city’s streets more walkable and bike-friendly, extending the use of and the information that transportation systems provide and enabling smart transportation choices. The Challenge includes a prize of up to $100,000 to fund pilots that test the top solutions in a real-world setting. Grand Rapids marks the third location for the City of Tomorrow Challenge, following announcements in Pittsburgh and Miami-Dade County earlier this month. Each challenge is tailored to a specific city or county and is focused on addressing its unique needs. By crowdsourcing ideas, the Challenge seeks to come up with ways for communities to employ technology to create the best mobility solutions that will underpin the city of tomorrow. Individuals are encouraged to share their experiences, sign up for community working sessions and offer insight into the ways they move around Grand Rapids HERE. Information about the Challenge also will be shared via Twitter. The week of July 23 marks the opening of the application period for participants to begin submitting ideas for new mobility solutions. Leading up to that, the City, Ford and their partners will combine insights from the online and offline communities with data analytics to help shape the challenge. In September, semifinalists will be selected to attend a prototyping session and receive mentoring support to refine their ideas before submitting a final pilot proposal. At the concluding stage of the Challenge, $100,000 will be awarded to fund pilots to test the top proposed solutions in collaboration with the City, Ford and its corporate collaborators. At its meeting on June 27, The Rapid’s Board of Directors selected Andrew Johnson as the next CEO. Johnson is expected to start in August 2018. “Andrew is a seasoned transit professional with more than 20 years of CEO and executive-level management in public transportation combined with previous private sector experience,” said Kentwood Mayor Stephen Kepley, who chairs The Rapid board. “We were impressed with his expertise, industry knowledge, and proven leadership. The Board is confident he shares our commitment to ensuring The Rapid is providing excellent service to its customers, is operating efficiently and effectively, and will take an innovative and collaborative approach to lead the organization,” Kepley added. Johnson is a Wisconsin native who currently serves as the chief operating officer at the Champaign-Urbana Mass Transit District (MTD) in Illinois. 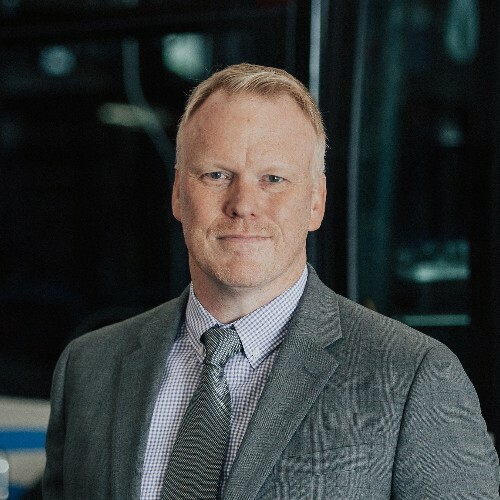 Prior to that, he was the CEO of Connect Transit in Bloomington-Normal, Illinois, which was recognized by the American Public Transportation Association (APTA) as the best system in its class in 2015. He is President of the Illinois Public Transit Association and holds a seat on the APTA Executive Committee. 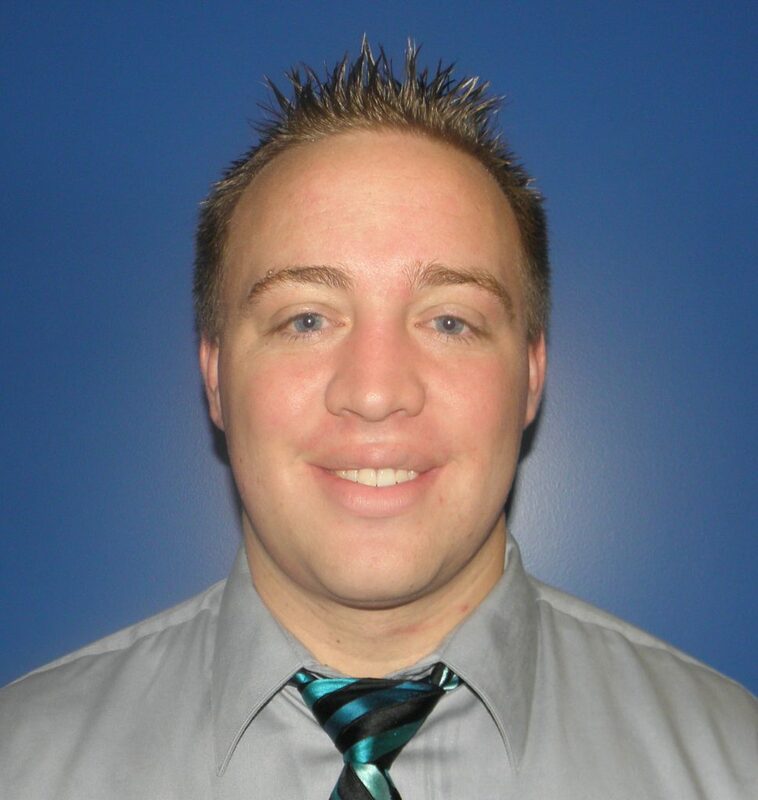 Johnson earned a Bachelor of Science in finance and a Master of Business Administration from Marquette University. Following the public interviews of Johnson and another finalist for the position, Board members said they were impressed by Johnson’s diverse achievements in contributing to public transportation system growth and redesign, rebranding, strategic initiatives, legislative and regulatory experience, and financial management expertise, and in particular, his successful track record of community engagement to build consensus. “I want to thank Peter Varga for his many years of service and his long list of accomplishments at The Rapid. The system is well-positioned for future success due in large part to his leadership. I know he is committed to a successful transition as he leaves The Rapid for his next adventure,” said Johnson.